Imagine standing on a high oceanfront bluff and giving yourself up to a gust of wind – being blown out over the edge of the cliff, rising on the upward thrust of a stiff onshore breeze, then soaring like a bird out over the Pacific. Imagine the exhilaration of riding an updraft with a gull, the joy of slow dancing with the wind. 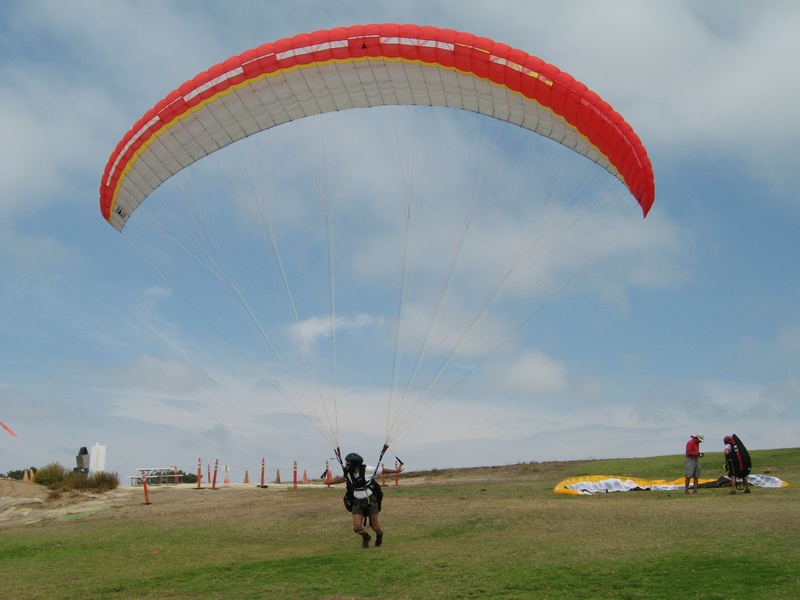 Paragliders do it every day at the Torrey Pines Gliderport. For those who don’t know the difference, hang gliders fly suspended from framed fabric wings. Paragliders sit in a harness suspended below a huge non-porous nylon “wing” that looks much like a parachute. At the Gliderport, bird wannabes can go for a 30-minute tandem flight with one of the on-site instructors (no experience required and no age limit though minors do need a parent or guardian’s permission). Your guide will outfit you in a lightweight helmet and help you into a harness – actually a soft, very padded chair – buckling straps around each leg and your waist. When you’re properly packaged, the instructor will slip into the harness just behind you and ask you to lean forward a bit while he maneuvers the voluminous nylon wing dawdling above your heads. In an instant you’ll understand the power of nature, its raw muscle. The inflated fabric wing will shove your backward, tug you upward. Just go with it. Let your feet float – a few inches off the ground, at first. Then, so quickly, so much more. In a split second you’ll be gone. Long before there’s time to think about it, you’ll be soaring. Out over the edge of the bluff, high above the Pacific Ocean. Like an oversized gull, you’ll ride the upward thrust of the breeze that hits the Torrey Pines cliffs. The exhilaration is sudden and overwhelming. Embrace it. Allow yourself to become that seagull. Free. Swoop down, glide higher, ride a thermal. Feel the power of your lofty multi-colored wing. Your wing. Savor the sensory simplicity of flight. Be awed by it. Love being a bird. 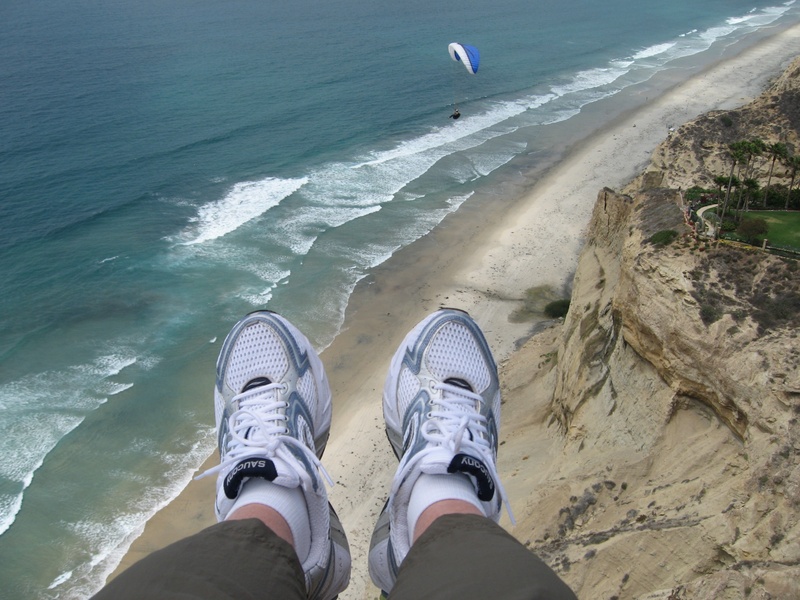 This entry was posted in Golf & Sports, Insider Tips, Outdoor Adventures and tagged extreme, flying, la jolla, north county, outdoors, paragliding, sports, Torrey Pines by Alison. Bookmark the permalink. If I had nerves of steel, I definitely will go for this extreme adventure experience. But the mere thought of looking over my feet and being in the air makes me anxious. Although, I guess it would be really different if I was harnessed to something, and paragliding with an instructor makes me rethink my stance.